So now that you know why you are buying seat covers – the next step is to determine what material or fabric to choose for them. This is important and really depends: what do you actually use your vehicle for? Keep functionality in mind to get what you need and want for your vehicle. While researching, you will come across Neoprene fabrics, canvas, CORDURA®, and Sheepskin — just to name a few. While it’s not possible to cover every car fabric out there, this guide will touch on the most popular materials you’ll find online. So what’s out there in terms of fabrics in the world of seat covers? This post is meant to help you conduct your online research with more knowledge and a better understanding of the main types of automotive fabric that are used to make seat covers (rather than discussing the original auto upholstery fabric that is found in your car). This way, you can make the decision all on your own. The best way to think about it is that each fabric offers a different level of Versatility, Protection, Comfort, and Customization. Lots of customers ask us what is Neoprene fabric? Similar to what wetsuits are made of, this kind of car fabric offers a great balance of comfort and protection (and is nice looking to boot). It fits perfectly around your seat’s shape, resists fading in the sun as it is UV protected, and is an all-around great choice for most drivers. Is There Really a Difference Between Neoprene and Neo-Supreme? The cost of Neo-Supreme seat covers is often a lot lower than Neoprene fabric, yet the material is formulated specifically for automotive use – unlike a Neoprene wetsuit — which might crack in the sun over time. ShearComfort sells only Neo-Supreme with a quality guarantee. Our car seat covers are highly customizable, and our Neo-Supreme materials come in a number of grayscale and bright colors, with two-tone options to offset any interior nicely. Do You Actually Need This Level of Protection? These two canvas-like car seat materials are similar, but CORDURA® fabric seems to win a few points over Ballistic canvas in terms of fit, quality, and installation (something to be aware of when reading reviews). Both are great for the extra tough use category, though. Sometimes you just need more out of a car seat material and that extra protection over comfort. Common needs are protecting your work site truck or SUV seats from mud and abrasion. Maybe your car or truck carries sporting equipment or gear often. Not to mention if your large dog hops in the back now and then. When your seats do take a serious beating, Ballistic and CORDURA® material are an extremely suitable choice. At ShearComfort, we only carry the best products. And we choose to carry custom CORDURA® seat covers. As CORDURA® is the real, branded fabric, we can assure you that this car seat material will resist punctures which will help you to avoid serious repairs or even the replacement of your current automotive upholstery fabric (not cheap!). These seat covers are also waterproof and easy to wipe down. One thing to keep in mind is that this type of car seat material may not fit as nicely as say Neo-Supreme, and is not generally as comfortable as others – so do yourself a favor and choose a different seat cover material if you don’t 100% need this level of protection — especially if you just drive your family sedan to work and around town. This is where you need to consider what you need out of the car seat upholstery fabric. This will help you order a seat cover that is ideal for you and your daily usage. Customization is still possible with CORDURA®. A handful of different colors are available to hide dirt or dog hair and contrast your interior or blend in with it. You can even go for a make-your-own combination of colors. 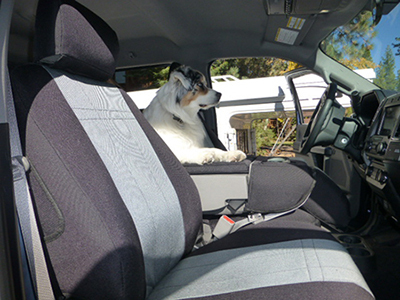 If you are looking for the ultimate in protective seat covers, then CORDURA® is the way to go. Comfort - Sheepskin Fabric or Leatherette Material? Are These Types of Car Fabrics Suitable for Long Drives, Sore Backs, and Insulation? Let us not forget the importance of pure comfort. Probably one of the most comfortable, not to mention luxurious, car seat material out there is Sheepskin. It is important to know that there are different grades of sheepskin out there. There is a BIG difference when buying real Merino Sheepskin and Imitation Sheepskin. Not only will it look different, it will also feel different. 100% Sheepskin fabric is more high wearing, with its nice leather hide that also acts as an insulator. 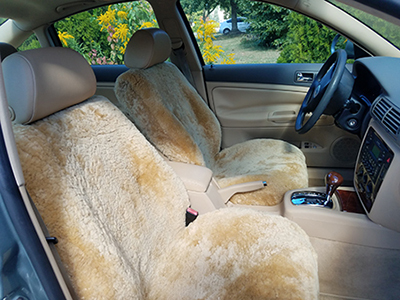 There are many companies out there that sell fabric seat covers made of Sheepskin. You will notice that there are two types: ready-made and tailor-made Sheepskin seat covers. At ShearComfort we sell authentic New Zealand Merino Sheepskin in both ready-made and tailor-made. You get quite a few choices in color too, which is nice if you are trying to complement the interior. 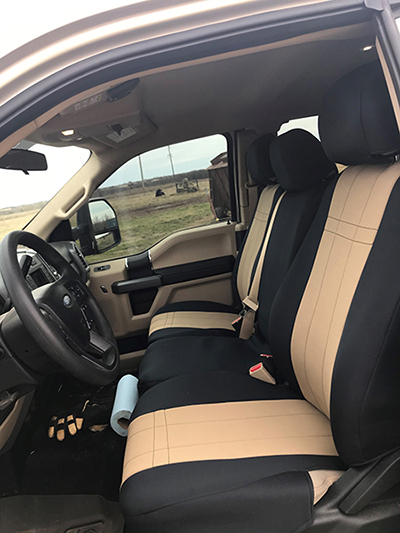 Now, it is hard to top the comfort of Sheepskin material, but there is another solid contender when it comes to luxury: Imitation leather seat covers. Many companies offer Imitation Leather material but it is often called by different names. ShearComfort is one of those companies and to keep things simple we call it “Leatherette”. 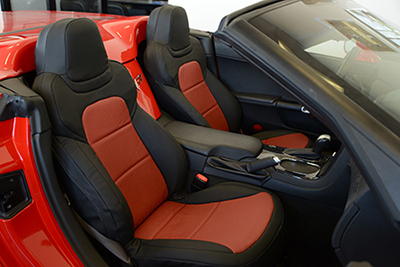 As we love to give our customers options, we offer both a Leatherette line and a Leatherette Luxury Line Rest assured that both types of seat covers are made of high-quality Imitations Leather and are guaranteed to fit. Although, the Luxury Line is a step up and provides additional options such as perforations if you have air conditioned seats. Something that Leatherette has on Sheepskin though is that it is actually a waterproof material, so it can be categorized as a highly protective seat cover as well. Note: Like leather, Leatherette is susceptible to weather conditions. So, if it’s hot out, they may get a bit warm to sit on. Contrarily, if it’s chilly out, they may be cold when you first hop into the car. Not an issue if you have heated or air-conditioned seats, which these fabric car seat covers are designed to work with. It’ll just take a minute longer to warm up or cool down than your original automotive upholstery fabric. You could also opt for the real deal and purchase Genuine Leather seat covers. These premium quality seat covers can upgrade the look of your vehicle’s interior, much like a leather reupholstery kit, but are far more affordable. Both Leatherette and Sheepskin are higher priced luxury seat covers. If you’re looking for something a bit more affordable, car seat material types like Velour can be a good solution. Velour is velvety to the touch with a lower price point. Also, there are well-ventilated Mesh seat covers out there that will give you extra comfort during hot summer seasons. Once again, it is important to consider functionality when deciding. If you need the extra support and want something luxurious, Sheepskin is perfect for you. But if you’re not interested in Sheepskin or maybe need something that is waterproof, Leatherette is also comfortable and luxurious and is the right way to go. Now that we’ve explained a few of these products, it should be clearer as to what type of material will offer you comfort and luxury. Realtree Camo is a unique and highly detailed Camo fabric. Those that like it, love it. It’s just such a personalized look. Much like other seat covers styles out there, you have many options in terms of material and designs. You might wonder how can one Realtree Camo Seat Cover vary from the next. Well, there’s one huge difference between ShearComfort Realtree Camo Seat Covers and others: our seat covers are made of a high quality, high wearing, and waterproof canvas material that will protect your seats from pretty much anything. To elaborate, our Realtree Camo Seat Covers are a lot more like CORDURA®. They are perfect for hunters, fisherman, mudders, campers, hikers or any other outdoor activity. You won’t have to worry about getting a bit dirty and hopping into the car with the canvas material protecting your seats. You can find other Realtree Camo Seat Covers made of cloth material and sometimes Neoprene as well. However, in most cases when you’re looking for the real deal Realtree Camo material, you’re probably looking for something that can stand up against any kind of active and outdoor lifestyle. ShearComfort offers Realtree Camo Seat Covers in many different patterns – AP, AP Green, Pink, and Snow -- all made of that same high wearing canvas material. If you’re buying ShearComfort car seat covers, personalization is always a possibility. We have the option of a solid camo canvas car seat covers or a sport look which will have black on the outside panels. ShearComfort is all about personalization. When you’re shopping for Realtree Camo Seat Covers, we also suggest that you take a look at our Luxury Line. We have taken the Realtree Camo patterns you love and created something extremely luxurious. Using high end canvas material combined with serious attention to detail, our Luxury Line will give your car, truck or SUV that jaw-dropping, head-turning look -- all the while incorporating your love for Camo! It is important to note that both lines of Realtree Camo Seat Covers are custom made, guaranteed to fit, and highly protective. Why Opt for Canvas Camo Instead of Camo Neoprene Seat Covers? There’s something to be to said as to why many of our customers go for our canvas over the camo neoprene fabric available from others companies. 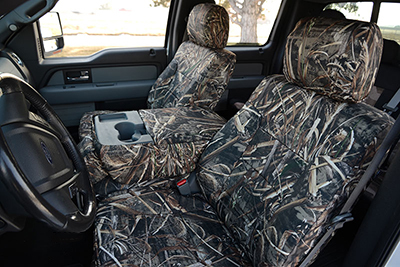 Our Realtree Camo is an upholstery material for cars and trucks that is really made to last. The reason why we’ve opted to only sell canvas Realtree Camo seat covers is because in many cases, customers who are purchasing them tend to be outdoor adventurers. While we cannot speak for everyone, we can say that there are a lot of hunters, hikers, campers, and just lovers of the outdoors who benefit from having the protection of this kind of high wearing seat cover fabric. 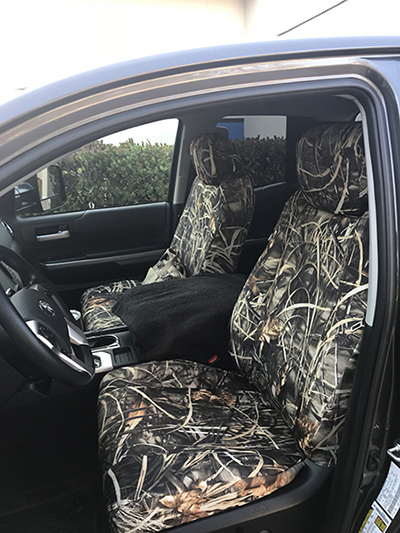 If you’re looking for all around protection, but want to personalize your vehicle, our Realtree Camo seat covers are a great option for you..Our sales agents can help determine what type of seat covers will suit both your wants and needs. If you ever have any doubt, we’re here to help. You may also fine our Seat Cover Center extremely useful in finding out what product is right for you. Like we said at the beginning of this section of our buying guide, there are a lot of types of car seat material out there. It can be hard to not get overwhelmed at times. By reading through some of the popular fabrics and their differences, you should have a better idea of what’s available online. Also, we remind you to think of functionality and your needs while trying to find the perfect automotive upholstery fabric for your vehicle. Of course, you should still order a material that you want as well, but by eliminating materials that might not fit your usage, you’ll narrow the list down and make it easier to choose.